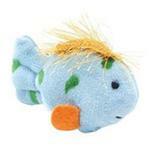 Cats will have some fishy fun with the Look Who's Talking Cat Toy Fish! Sounds keep my kittens playing. I love the little shirts you have for my 4.5lb. Chi. My ex-partner took all her clothes that I paid for when we broke up as I'm sure you can look at how much of my money she spent on your site for Buttons. I am trying to rebuild her wardrobe a little at a time.